LAS VEGAS — No one could have expected this: heavy rain, in Las Vegas, the desert — even in January. On Tuesday, as attendees gather for the Consumer Electronics Show here, the city is sodden: rain pouring down over the usually sun-splashed statues, palm trees and flashing neon signs. But here we all are. It feels a little bit too early in the New Year to assess the best, the brightest and the newest in technology with full energy, despite the best efforts of the club music blasting through all the casino speakers. I’m fresh off the plane, and there’s a distinct air of change. Maybe it’s that the Web Summit, its sister tech conference Collision, and others like SxSW Interactive, ITE Expo and E3, among others, have been nipping at CES’ heels — CES has definitely upped its game. The content seems better curated and much more future gazing than last year. So what do we have to look forward to this year? Last year was all about the connected autonomous car; wearable tech for wellbeing (not just fitness); 4G TVs; and the connected kitchen. This year, there are signs that all of those are still hot devices, but the conversations have progressed. The discussion about the autonomous car, for example, has moved on to talks about the "future city." Panasonic, in its press conference, talked about the holistic approach to city design and its relation to technology. Dr. W.P. Hong, president of Samsung SDS, is also to lead a talk on the future smart city. This all follows, of course, the buzz around Hyperloop, the original brainchild of Elon Musk, which is set to be the world’s first super train. On wearables, still a big topic here, I expect to see a lot more emphasis on mental health: mind being, mindfulness, meditation and stress. I’m also curious to see the role sound plays. Will Sonos, Bose or Beats by Dre appear? This seems to be a new battleground right now with many of these companies expanding into lifestyle categories, and even interiors, to market themselves. I’m hoping to see what’s next. What else? Interesting … Last year there were a lot of speakers from major cable networks talking about the threat, or perceived threat, of cord cutters. This year, those cord cutters are out in full force. Media, entertainment, and online players in the space are a big focus at CES 2016, from Netflix to Hulu and Sling. Reed Hastings, CEO of Netflix, is giving a keynote. What’s clear is that TV entertainment is being disrupted. It’s not over by any means, but the industry needs to adapt to an audience that is consuming media for free, or cheaply, on its own terms and expects that across the board. Consumers want traditional entertainment live, now, when they want it, and the option to save it, so it’s not dependent on the Internet and can be viewed at a later date. As ever, the "internet of things" is still a big theme here. The kitchen, and its family use for food, entertainment, and lifestyle, has become a core focus with all brands trying to own the space. Both LG and Samsung in their press unveilings on Tuesday showcased new products to this end. LG’s smart fridge has a transparent switching front. Samsung’s takes photos of the food inside and allows consumers to replenish items by clicking on their picture. Oh, and you can also share pictures on social media and play music. 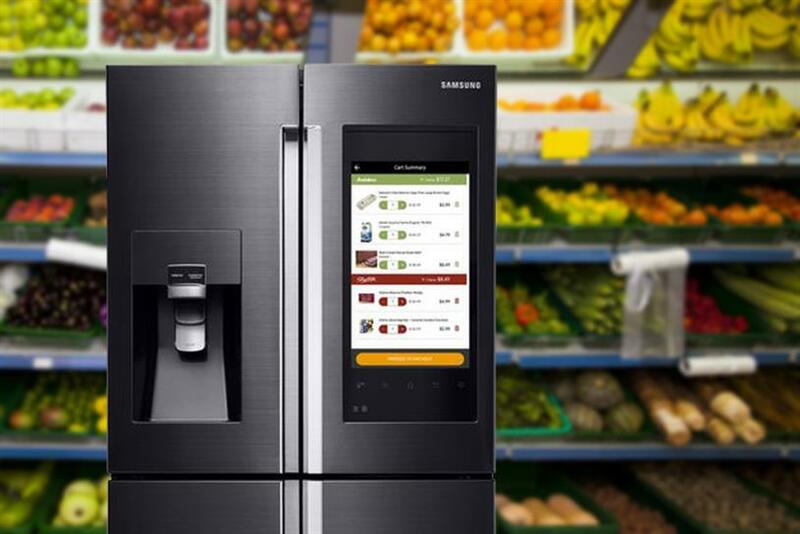 Samsung has embarked on collaboration with MasterCard to facilitate commerce from its connected home objects, which is an interesting move for the company — it’s moving beyond payments. MasterCard is becoming the platform through which all payments for connected products (such as eggs, coffee and milk) are bought through Samsung electronics. It will process payments by any credit card or debit card, it says. In other words, it’s thinking beyond simply being a credit card company and trying to emulate Apple with Apple Pay. All are interesting to watch.